The latest red-hot romances from Mills & Boon Modern! The Greek's Blackmailed Mistress by Lynne Graham ‘I do have an option to offer you.’ Three months between the Greek’s sheets! Blackmailed into the billionaire’s bed? Elvi can’t believe her attempt to appeal to heartless Xan’s benevolent side has gone so wrong! But to save her stepmother’s job she nervously agrees to the Greek’s outrageous terms. Xan is gorgeous, with a damaged side only Elvi sees—but how will he react when he realises that his new mistress is an innocent virgin? Princess's Nine-Month Secret by Kate Hewitt ‘The princess is pregnant.’ With the Italian’s baby! For a stolen night of freedom, ever-dutiful Princess Halina throws caution to the wind and succumbs to the seduction of notorious Rico Falcone. Yet the consequences of their insatiable passion lands Lina in royal disgrace. When she’s hidden away to conceal her shocking secret, ruthless Rico storms the palace! He’ll do anything to legitimise his child—he’ll even make Lina his wife! Claiming His Wedding Night Consequence by Abby Green Nicolo’s discovered his runaway bride…And the secret she’s kept from him! Nicolo Santo Domenico’s marriage to heiress Chiara is purely for convenience…until their explosively passionate wedding night! But when Chiara realises that Nico’s reasons for seducing her are as cold as his heart, she flees their fledgling marriage. Months later, Nico tracks down his errant wife, only to find she’s expecting! To claim his baby, Nico must make Chiara his—for real! 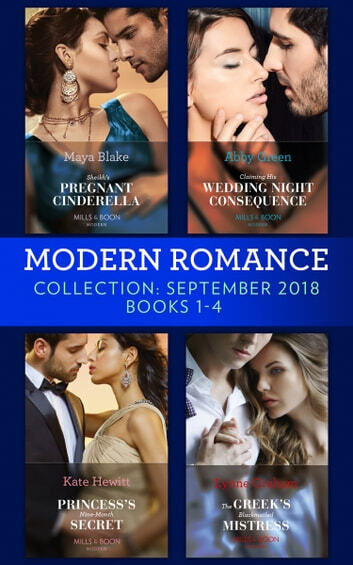 Sheikh's Pregnant Cinderella by Maya Blake From making the royal bed…To carrying the royal heir! It’s the day of the royal wedding, and everyone who’s anyone is in attendance—except the bride! Refusing to let being jilted disrupt his kingdom, duty-bound, cold-hearted Sheikh Zufar commands timid maid Niesha be his stand-in Queen. Their marriage is coolly convenient, but behind closed doors their chemistry burns fiercely… And Niesha’s shock pregnancy will test Zufar’s iron control more than he could ever have imagined!